During surgical procedures involving the brain, the typical surgical method utilized is known as a craniotomy. This procedure. is done in order to access the brain and begins with a section of the skull, referred to as a bone flap, is removed in order to give access to the brain. After the procedure, the piece of bone is replaced by a plate and screws, although on occasion the bone might be inserted back into place. 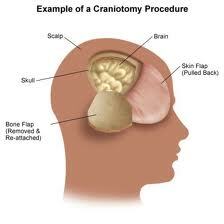 There are different reasons as to why the craniotomy might become a required surgery. Usually, this is needed if there is swelling in the brain, blood clots, brain tumors or other issues with the brain and a doctor needs direct access in order to remove the problem area. The overall size of the bone flap removed is going to depend on the size of the problem area. Usually, after the completion of the surgery, the individual does have to remain in the hospital for anywhere from a few days all the way up to few weeks. All of this really depends on what the procedure is and how much material is removed during surgery. There are different potential areas where the bone flat can be cut, which is going to go along with the sort of surgery that is required. The different areas include the parietal, which is the top portion of the skull, the frontotemporal, which is the front portion and goes right above the eye sockets, the temporal, which is the location along the sides and extends back from the rear of the jaw bone to the back of the skull, and then there is the suboccipital, which is the back rear end of the skull. Each of these areas are going to require different methods for cutting into the skull, in order to keep the brain safe.